Extreme Air® CPC9-M hand dryer revolutionizes clean. This dryer is made with patent-pending Cold Plasma Clean™ technology, which will KILL GERMS while DRYING HANDS	and SANITIZE the surrounding air. The only hand dryer that kills small viruses and microbes, including bacteria naturally, without chemicals. . Steel White Epoxy. COLD PLASMA CLEAN kills germs (including E. Coli, Staph, MRSA and TB) on and around hands naturally without chemicals. Dries hands while sanitizing the surrounding air. MOST COMPACT high performance hand dryer in the industry. It’s 43% smaller than old “industry standard” high speed dryers; yet, it’s just as powerful and uses less electricity. ADJUSTABLE SOUND AND SPEED - New patent technology allows the hand dryer to be adjusted to your preference - providing the perfect balance of speed, energy efficiency and sound. It's ideal for sports stadiums, schools or a quiet library. VANDAL RESISTANT – Two tamper resistant screws secure the heavy duty vandal resistant cover to the steel base. Motor and heater are inaccessible to vandals. Air intake is shielded for additional safety. ULTRA LIFE HIGH PERFORMANCE MOTOR – Motor lasts longer and is quieter. The 5/8 HP motor is adjustable from 24,000 to 14,000 RPM. Automatic resetting thermal protector. SMART SENSOR Ultra energy-efficient, microprocessor-controlled sensor turns dryer on when hands are under the outlet for up to 35 seconds. Standby power is only one watt. Features RoHS compliant lead-free design. HEATING – (CPC AND GXT SERIES) The heating element has an automatic thermal protector and operates in the black range for maximum life. WARRANTY – 5-year limited warranty with same-day factory repair or shipment of replacement parts. ADA Compliant Wall Guard (optional above) – This innovative accessory allows for the hand dryer to meet ADA compliance once it is installed. The unique feature of this product is that there is no longer a need to cut a hole in your wall to install it. Patent pending design. ADA Compliant Recess Kit (optional above) – The stainless steel recess kit gives you the wonderful option of making a surface mounted hand dryer ADA compliant, once properly installed. To install this recessed kit, you first need to measure and cut a hole in your wall that is the appropriate size. Then install the recessed kit and mount your surface mounted hand dryer to it. 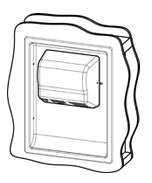 Adapter Plate (optional above) – This universal adapter plate is designed to cover a preexisting mounting holes in your wall that is left there from a previous unit. You can then use this plate to mount a surface mounted hand dryer onto it. This universal adapter plate is designed to work with many types and brands of surface mounted hand dryers.